The Oxbo 4420 is a multi-function power unit for year-round vineyard operation including harvesting, spraying, pruning, mowing, and other common vineyard tasks. The Oxbo 4420 represents the next generation in multi-function performance--maximizing fruit quality without sacrificing productivity. 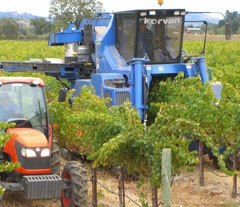 The 4420 exemplifies Oxbo's commitment to moving our vineyard products forward. The 4420 represents the culmination of over 250 changes since the original introduction of the Korvan 4012. A tight turning radius and 30-inches of industry leading side-to-side leveling makes it the machine of choice in the most demanding vineyard conditions. The powerful 275hp turbo charged, Tier III engine is positioned low for enhanced stability, easy maintenance, and economical operation.